Tonight is a night for taking it easy, but I just couldn’t pass up sharing this incredible picture with you. Teeny, tiny, garden guardians, hatching in my tomatoes this afternoon. Edit – 3 July 2009: It has been brought to my attention that these are not, actually, baby ladybugs. They are, in fact, evil biting bugs that most likely intend to infiltrate my tomatoes. Ahh, well. They’re still adorable, ain’t they? Lady Bugs Rock, I always know my garden is doing well when the top predators arive, my personal favorite Pray Mantis. i am so incredibly jealous. you have to tell me how you did this! i released at least 1k ladybugs about 2 weeks ago. i’ve also done so in the past. i’ve never had that kind of result… so jealous. CONGRATS. i have to see your garden. let’s compare field notes some time, for real. Nice shot. I just found your website yesterday and I’m loving the urban agriculture that you’re doing – I wish I could get away with a couple of chickens (and ducks) where I live! @ Don – I would love to find a mantis! They’re one of my favorite insects. I loves me some lady beetles. Have you read any literature on what is effective per square meter? 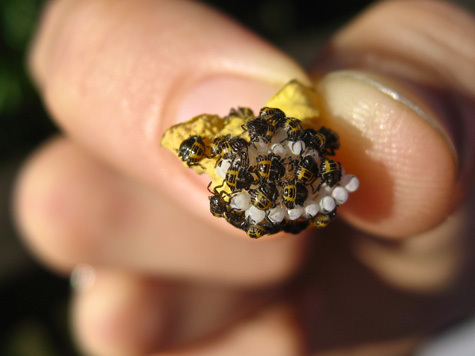 I just ask because lady beetles disperse like woah after they pupate. Mantids might be a nice option, too. If you’re looking for another really great, voracious predator, check out brown or green lacewing larvae. They nail aphids and other pests like crazy. Ginger Baker – Jealous!!! Did you keep them and hatch them? Co – Thanks for the heads up! I do have a lot to learn about beneficial insects and natural pest predators. Add it to the ever-growing list, haha! You mentioned that these were not, in fact, ladybugs. What are they?? My parents just found some in the garden today and I can’t find what they are anywhere online. @ Tracy Belaski – They belong to the order Hemiptera – ‘true bugs’. They are evil little plant eaters! If you can, get them outta there!